Today is Yukon Heritage Day! 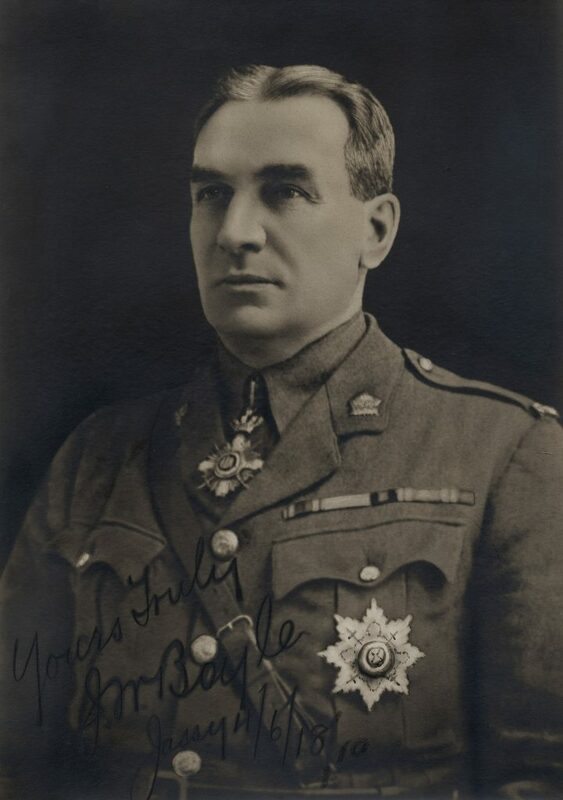 Do you know about “Klondike Joe Boyle”, one of Canada’s most legendary First World War figures who never formally enlisted with an active military force? Joseph Whiteside Boyle, was born in Toronto, Ontario in 1867. An entrepreneur with an engineer’s ingenuity, Boyle headed north in 1897, arriving in Dawson City, Yukon just as the Klondike Gold Rush began. A savvy businessman, Boyle built up a massive gold dredging operation, earning himself the nickname “Klondike Joe Boyle”. Courtesy: Woodstock Museum National Historic Site, Catalog Number 1950.1.1a . Following the declaration of war in 1914, Boyle offered to raise an entire machine gun unit, which was readily welcomed by the Minister of Militia, Sam Hughes. Reaching France in August 1916, the Yukon Motor Machine Gun Battery was attached to the 1st Canadian Motor machine Gun Brigade. It would serve with distinction at Courcelette, Vimy Ridge, Passchendaele, the German Spring Offensive of 1918, and in the Hundred Days. Meanwhile, back in Canada, desperate to be nearer to the action, Boyle left the Klondike for England in 1916. 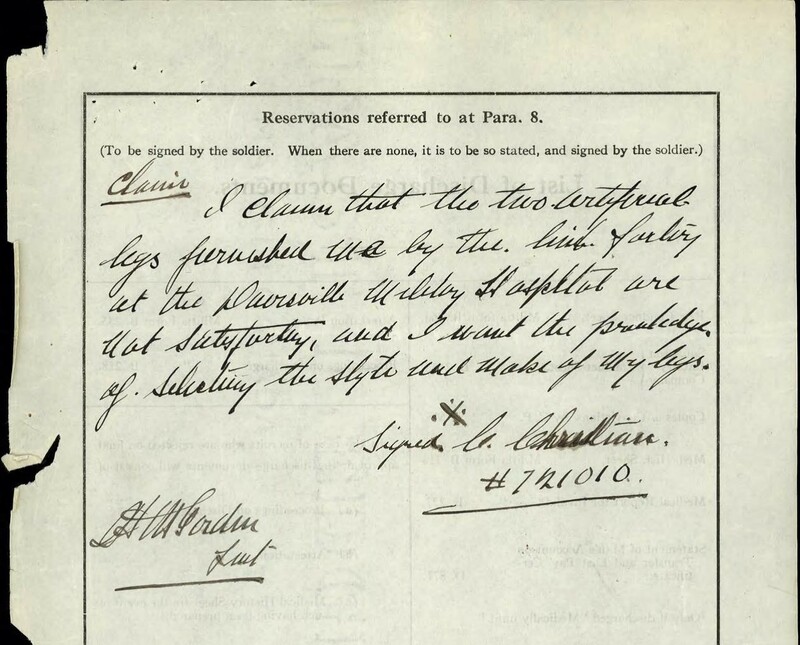 Too old for military service, Boyle was made an Honourary Colonel of the Canadian militia. Still dissatisfied, Boyle volunteered with the American Corps of Engineers. By 1917, Boyle had found his way to Russia, befriending the Tsarist family and re-organizing the faltering Russian railway system that had hindered the country’s war effort. Arriving in Tarnapol as the Russian defenses crumbled, Boyle, without military authority, took it upon himself to organize an emergency defensive line that held long enough for the Russians to make an orderly retreat. Following the Russian Revolution in November 1917, Boyle managed to smuggle the Crown Jewels of Romania out of the Kremlin and return them to the Romanian royal family. In 1918, Boyle worked with British secret service agents to organize acts of sabotage against German and Bolshevik forces. Together, they oversaw a network of approximately 500 spies. In Romania, Boyle mediated a ceasefire and in April rescued 70 high-ranking Romanians held captive by revolutionaries in Odessa. After the war, he secured a $25-million credit from the Canadian government to the country of Romania. In all, “Klondike Joe Boyle” was granted the title of “Saviour of Romania” and awarded the Star of Romania with sash, the British Distinguished Service Order, the French Croix de Guerre and the Russian Order of St. Stanislaus. The government of Canada has never officially recognized his actions. Following his death in 1923, an unknown woman dressed in black visited Boyle’s grave to place flowers. The mysterious visitor returned each year until the death of Queen Marie of Romania in 1938. 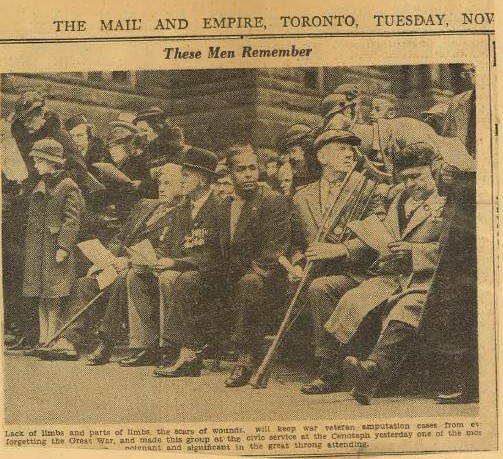 Curley seated with fellow disabled veterans during the 1936 Vimy Pilgrimage. Ethelbert ‘Curley’ Christian was born in the USA in the 1880’s (the recorded date and location vary by source). A man on the move, Curley traveled extensively in his early years while working. In 1915, Curley was in Selkirk, Manitoba when he enlisted with the 108th Battalion (Selkirk) of the Canadian Expeditionary Force. Nicknamed “Curley” by his mother for the curls in his hair, Curley even signed his Attestation Papers as such. Once overseas, Curley was transferred to the 78th Battalion (Winnipeg Grenadiers). 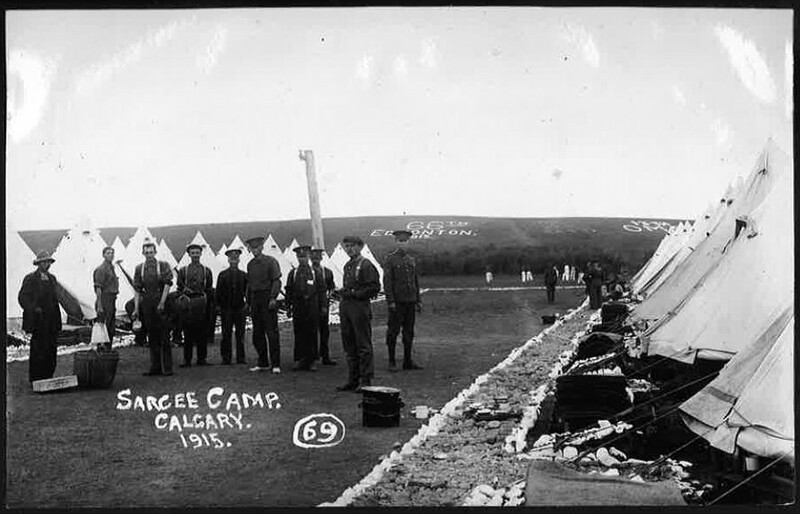 During the Battle of Vimy Ridge in April 1917, Curley was severely wounded, likely from artillery fire, and, according to his family’s account, was buried in mud and debris for two days. When he was finally discovered underneath the debris, gangrene had set in his wounds, prompting doctors to amputate all four of his limbs. 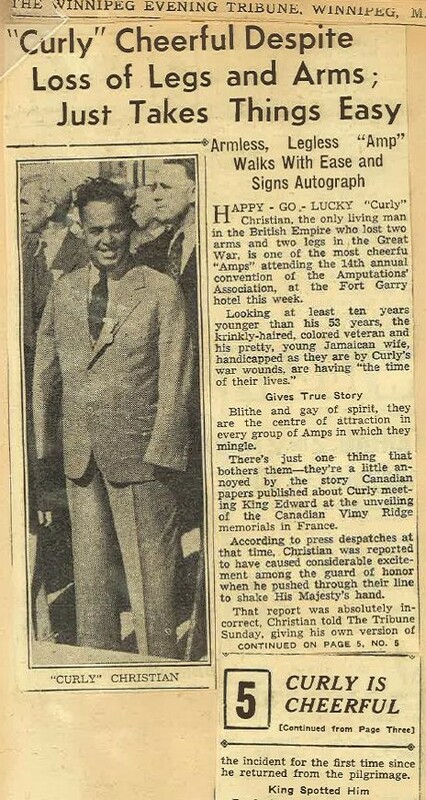 Fortunately, Curley would survive the horrific ordeal and return to Canada as the nation’s sole quadruple amputee of the First World War. Curley’s cheerful disposition enabled him to become a champion of war amputees. Forever a man on the move, Curley was not to be slowed down by the loss of his limbs. In post-war Canada, he became a sort of public figure, championing initiatives for the care of war amputees and disabled. While recovering at Euclid Hall in Toronto, he met a nursing aid, Cleopatra McPherson; the two would marry in 1920 and raise a child. In 1936, Curley boarded the S.S. Montrose and returned to Europe with the Royal Canadian Legion’s Vimy Pilgrimage. During the unveiling of the Vimy Memorial, Curley broke through the crowds and guards to introduce King Edward VIII to the blinded veterans. 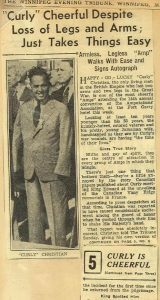 Ethelbert ‘Curley’ Christian passed away on March 15th, 1954, at approximately 70 years of age. He is buried in the Prospect Cemetery section of the Mount Pleasant Cemetery in Toronto. 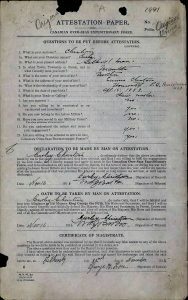 In this note from his Service File, Curley claims that “the two artificial legs forwarded me by the limb factory at the Dunnsville (sic) Military Hospital are not satisfactory, and I want the privilege of selecting the style and make of my legs.” (Editor’s Note: He may be referring to the Haldimand War Memorial Hospital, in Dunnville, Ontario est. 1920). 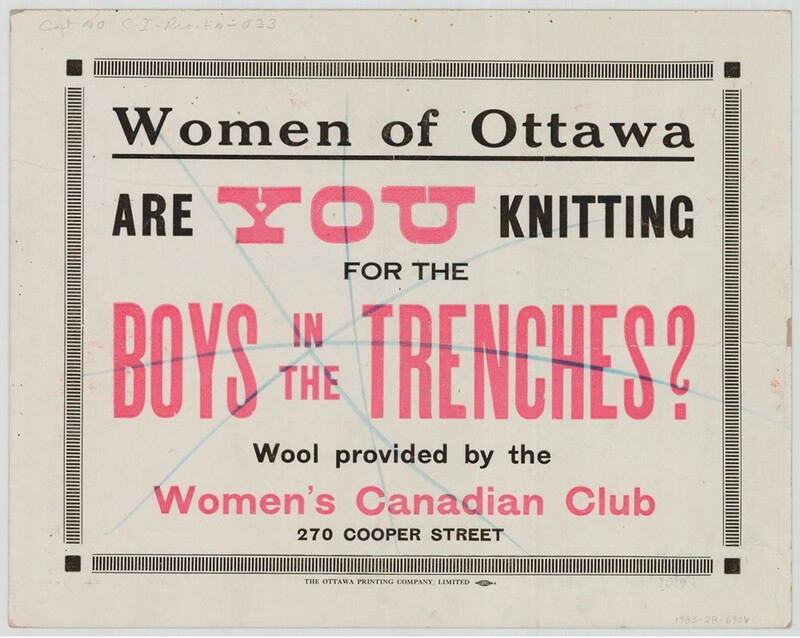 Credit: Personnel Records of the First World War, Library and Archives Canada, Reference Number: RG 150, Accession 1992-93/166, Box 1695 – 54. Item Number: 100301. Nicknamed “Curley” by his mother for the curls in his hair, Ethelbert “Curley” Christian even signed his Attestation Papers as such. On 16 July 1936, 6,200 pilgrims departed the port of Montreal, embarking on the Vimy Pilgrimage, sailing across the Atlantic Ocean as they had done just two short decades ago. The unveiling of the Canadian National Vimy Memorial was to be a massive event, full of both boisterous revelry and solemn commemoration. 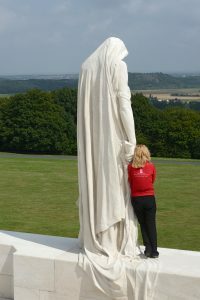 We have covered the Vimy Pilgrimage of 1936 extensively in our 100 Days of Vimy posts leading up to 9 April 2017 and they can be read again here: http://www.vimyfoundation.ca/tag/100daysofvimy/ . However, a lesser known story in the history of the Vimy Pilgrimage of 1936 is that of the Canadian Pacific Steamship’s SS Montrose, a namesake of a pre-war ocean-liner that fulfilled a critical humanitarian role in the early days of the war in 1914. 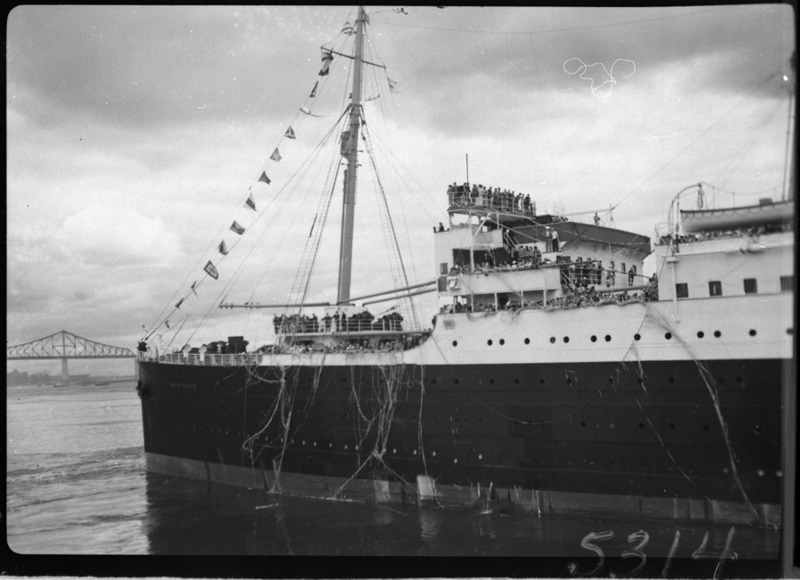 The packed decks of the Canadian Pacific Steamship, SS Montrose, littered with ticker tape confetti, departing the port of Montreal for the Vimy Pilgrimage in July 1936.
Credit: Clifford M. Johnston/Library and Archives Canada/PA-056950. Launched in 1897, the first SS Montrose served as an ocean-liner between England and Quebec before becoming a troopship in the South African Boer War of 1899-1902. In 1903 the Montrose was acquired by the Canadian Pacific Steamship Company (CPS) and again reverted to transatlantic voyages. During the chaotic “race to the sea” in 1914, the Montrose was moored at Antwerp along with the CPS’ SS Montreal as the German Army closed in on the critical port city. The Montreal was loaded with coal, but its engines were not serviceable, while the Montrose was empty of coal, but seaworthy. Captain H. G. Kendall, best known as ship master of the RMS Empress of Ireland, was working in Antwerp in a supervisory role at the time, not having mastered a ship since the Empress’ fateful day in the St. Lawrence River. Captain Kendall, sensing the urgency of the situation, had the coal transferred from the Montreal to the Montrose, and the Montreal taken in tow by the seaworthy Montrose. Working with the British Consulate, Kendall loaded both ships with Belgian refugees and sailed them to safety in England. The Montrose was later sold to the Admiralty to be used as a blockship at Dover, where it broke loose and was wrecked. In 1920, a second SS Montrose was built and launched by the CPS, serving many years as an ocean-liner, including as one of the esteemed ships of the Vimy Pilgrimage of 1936. Carrying on much like its namesake predecessor, the second SS Montrose would serve in a time of crisis as well, being requisitioned by the Admiralty in 1939 and retro-fitted to serve as the HMS Forfar, an armed merchant cruiser of the Royal Navy. On 2 December 1940, HMS Forfar was torpedoed by a German submarine off the coast of Ireland while joining up with a transatlantic convoy. One-hundred and seventy-two crew members perished in the sinking of HMS Forfar, a sad final chapter in the Montrose saga. 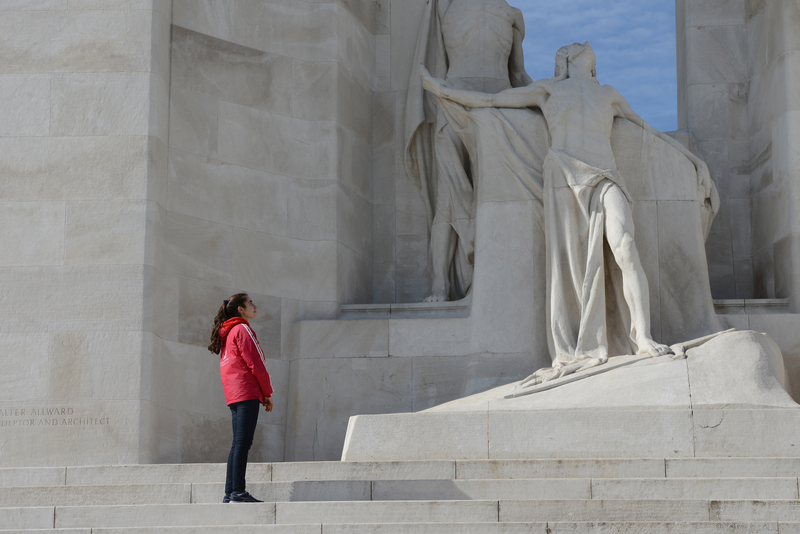 Each Saturday, we’ll share some reflections from our past student participants about the impact of their visit to Vimy Ridge and other sites of the First World War. Adam visits Frederick’s grave at the Villers Station Cemetery, France in 2016.
Credit: The Vimy Foundation / Hanna Smyth, 2016. Frederick Gordon McNeil was born on July 20, 1897 to first-generation British immigrants, Archibald and Louisa McNeil. Similar to other immigrants populating the “Final Frontier” of Canadian Prairies, the McNeils faced difficult circumstances in their new home. McNeil enlisted in the Canadian Expeditionary Force on January 4th, 1916 at only 18 years of age – just six months over the minimum age requirement. He enlisted with the legendary 46th (South Saskatchewan) Battalion, otherwise known as the “Suicide Battalion” of the 4th Division. The 46th Battalion justly earned this cynical nickname. Over a period of 27 months, 3,484 men were injured and 1,433 killed, a 91.5% casualty rate. Seemingly every deployment of Frederick and his unit was to an area destined to become of extreme strategic importance. 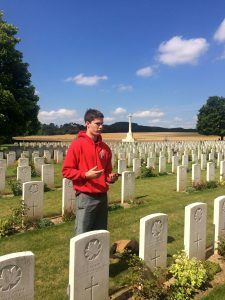 Unfortunately, McNeil became one of those casualties on May 1st, 1917 in the aftermath of brutal battle for Vimy Ridge, when he was killed in action relieving the 50th Battalion at trenches east of Liévin, France. I felt a connection choosing someone that grew up in my city and who was only a year older than myself when he enlisted. By the time Frederick came of age, word had reached home of the inhuman conditions on the front, and the excitement for war had begun to ebb, yet Frederick was still eager to serve his country. It is this courage that I greatly admire, and is another reason why I chose to commemorate this man. 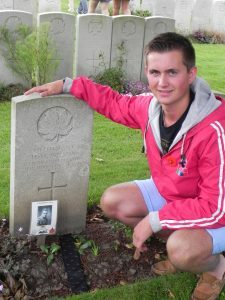 Just like the First World War and the legacy it left, Private Frederick Gordon McNeil will never be forgotten. 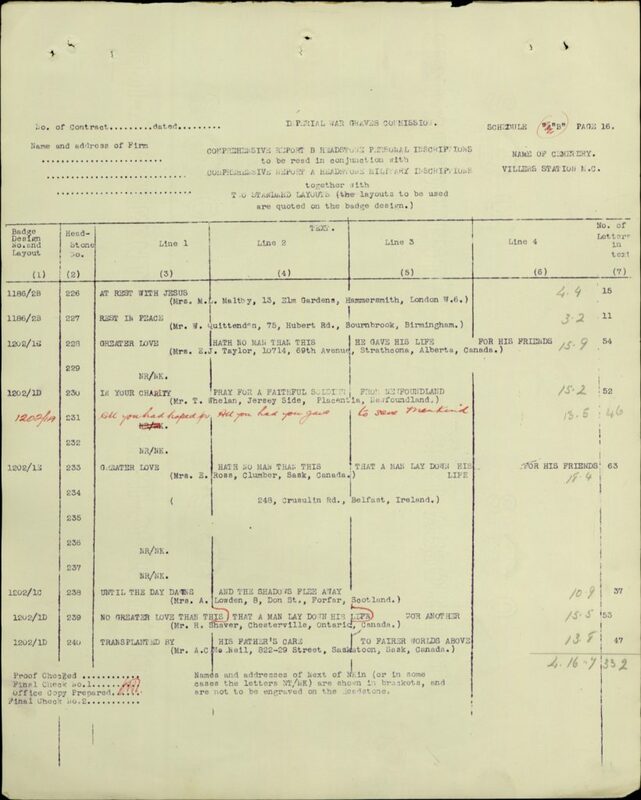 The headstone inscription requested by Frederick’s father can be read in the last row of this document (See Row 1202/1D, Headstone no. 240). Credit: Commonwealth War Graves Commission, Find War Dead, Casualty Details, McNEIL, FRED GORDON, 2017). The 100th Anniversary of the Battle of Vimy Ridge is just two days away. 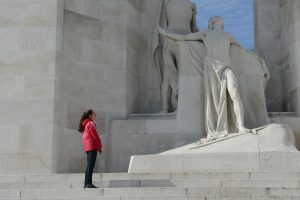 On monumental occasions such as these, the importance of education and raising awareness about Canada’s history often comes to the fore in public discourse. 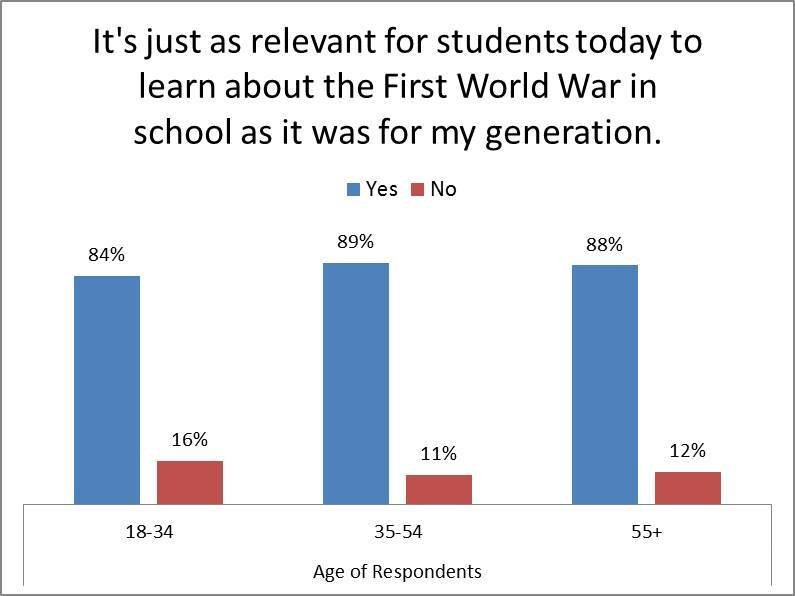 Consequently it is interesting, and encouraging, to note the results of the Vimy Foundation’s April 2016 poll, when the overwhelming majority of Canadians (87%) agreed with the importance and relevance of carrying on this education. Source: IPSOS Reid Poll for The Vimy Foundation, April 2016. Beaverbrook Vimy Prize recipient Joshua Gatcke at the grave of Lieut. H.M. Wilson, an alumnus of Joshua’s school, Ridley College. Joshua shared Wilson’s story with his peers and left behind a photo and tie from their alma mater. Credit: The Vimy Foundation, 2014. 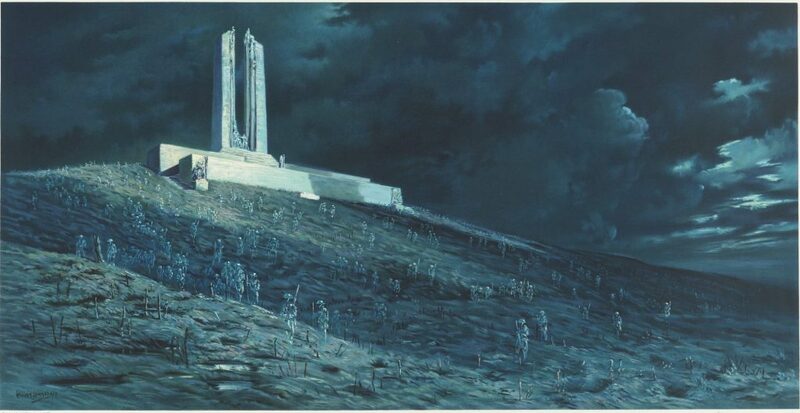 On April 9th, for our final post in the 100 Days of Vimy series, we will be discussing Walter Allward’s vision for the Vimy Memorial. Today, we’re asking you to share who, or what, you commemorate, when you visit a war memorial or attend a remembrance service. 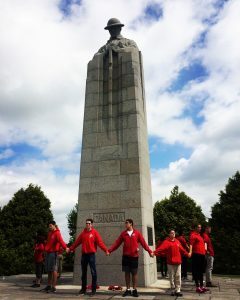 2016 BVP students at the St. Julien Memorial in Belgium. They joined hands, facing outwards, to symbolize that together, they would defend and further Remembrance. Credit: The Vimy Foundation, 2016. Comment on our Facebook post, Instagram post, or tweet at us by 11:59pm PT on Thursday, April 6th. Only one submission permitted per account per platform (i.e. if you have an account on both Facebook and Twitter you can enter twice; you cannot submit two entries through Facebook). One winner will be chosen at random from all eligible entries received during the time period on all platforms. The winner will be contacted on Friday April 7th, 2017! These contests are not sponsored by Facebook, Instagram, or Twitter. 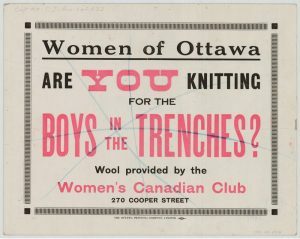 Poster calling for assistance in the war effort at home. Credit: Library and Archives Canada, Acc. No. 1983-28-690V. Over the last three months we have shared many stories about the contributions of women in the First World War. 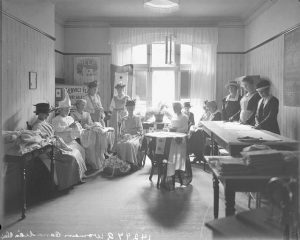 Aside from the official organizations such as the YWCA, the Imperial Order Daughters of the Empire, and the Canadian Red Cross, many women formed their own unofficial community groups, taking up the cause in any way they could. Small groups from churches, women’s clubs and social circles formed knitting, sewing and baking clubs. Following the Great Fire of Parliament in 1916, one enterprising women’s group sold bits of Parliament rubble as souvenirs to raise funds for War Bonds. As a result of these small efforts, Canada’s troops received a constant stream of parcels from home, with knitted clothing, baked goods, and cigarettes. 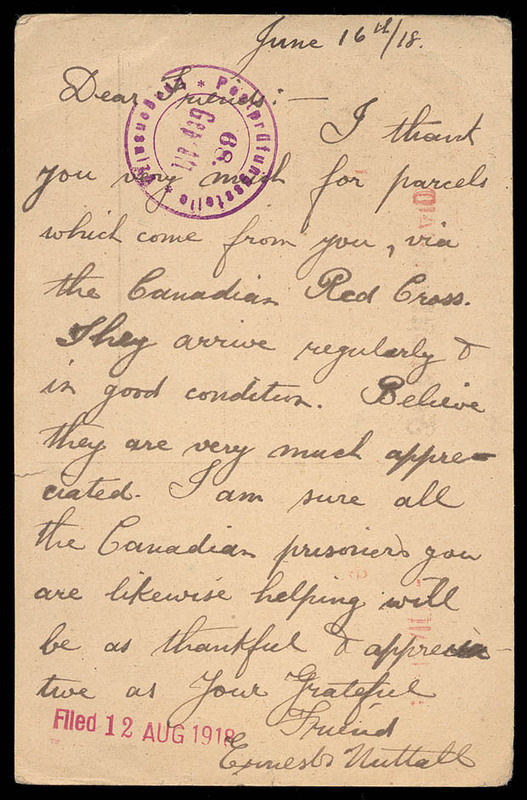 Even Prisoners of War were able to receive parcels through the Canadian Red Cross, which forwarded those it received from the women’s groups back home. 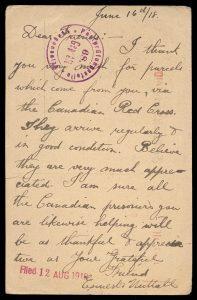 In this letter dated 16 June 1918, Private Ernest Nuttall of the 8th Battalion (90th Winnipeg Rifles) thanks Canadian women from within the Prisoner of War Camp in Langensalza, Germany. Credit: Library and Archives Canada / MG28-I35, vol. 4, World War I Prisoner of War Camp, financial statements, 1916-1918. 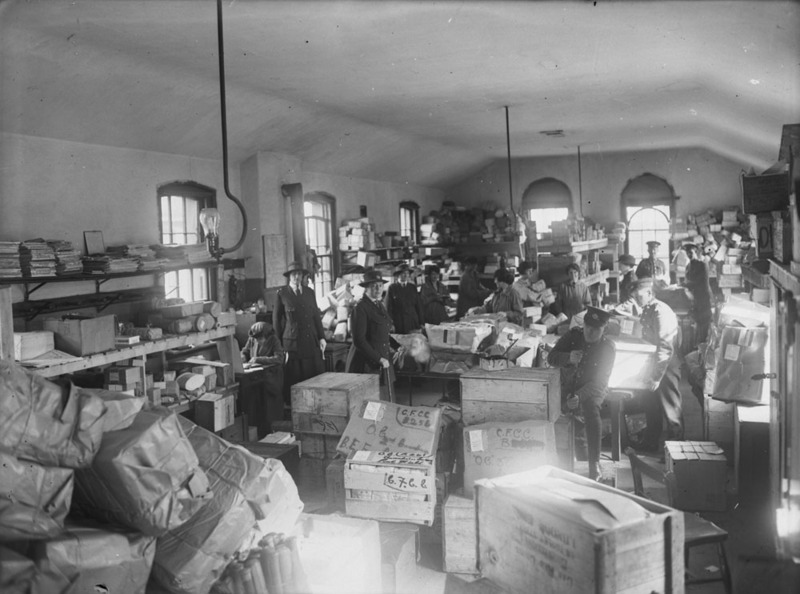 The arrival of Canadian parcels in England, to be forwarded to troops at the front. Credit: Canada. Dept. of National Defence/Library and Archives Canada/PA-005195. Cutting fabric to length with the Women’s Canadian Club. Credit: William James Topley / Library and Archives Canada / PA-800006. Members of the 66th (Edmonton Guards) Battalion march along Signal Hill in 1915.
Credit: The Military Museums of Calgary, 2017. An aerial view of the surviving geoglyphs in Signal Hill’s Battalion Park. Credit: The City of Calgary, 2017. 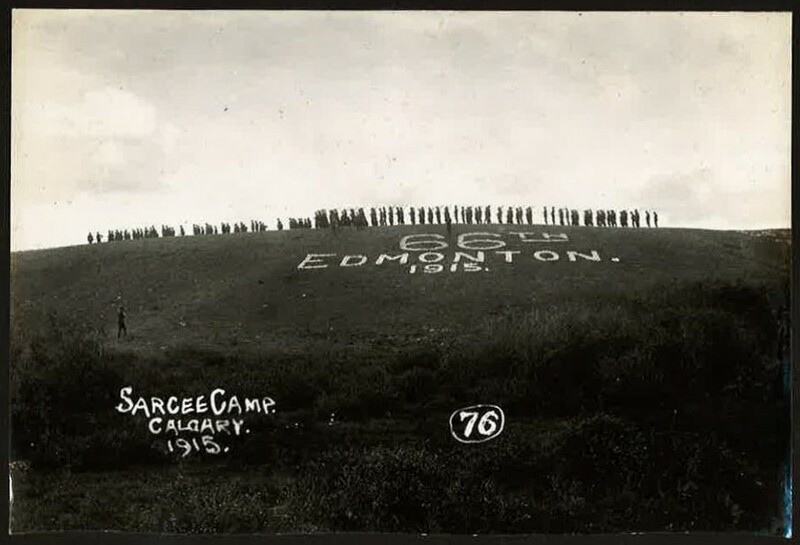 Signal Hill’s Battalion Park in Calgary bears a lasting monument by the men who trained at Sarcee Camp during the First World War. 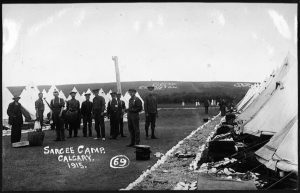 During the establishment of the camp, as part of their training, recruits were required to fill their packs with rocks from a nearby river, and march overland for two kilometres back to camp. The rocks were then used to mark their respective Battalion boundaries within the massive training camp. Before departing overseas, many Battalions took their collected rocks, white-washed them, and created massive geoglyphs of their Battalion numbers, on the side of Signal Hill. 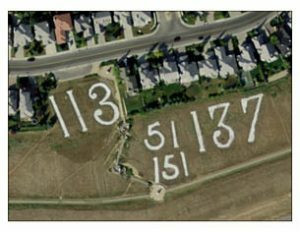 Today, Battalion Park contains the geoglyphs of the 51st (Edmonton), the 113th (Lethbridge Highlanders), the 137th (Calgary), and the 151st (Central Alberta) Battalions. These remain on Signal Hill today, as monuments to the 45,000 Canadians who trained and went to war from that spot. For additional information, follow the link for an interview with Senior Curator/Director of Collections, Rory Cory of The Military Museums of Calgary – http://alberta.ctvnews.ca/video?clipId=490428. 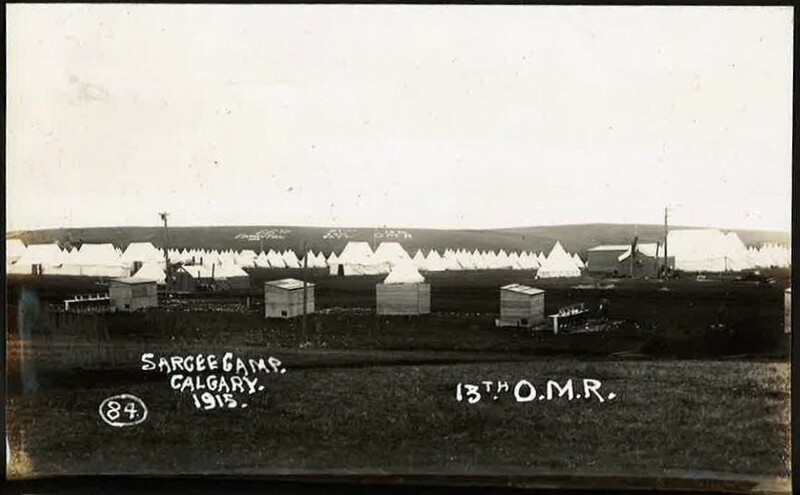 Photographs of Sarcee Camp in 1915 indicate the number of historical monuments that were destroyed by urban development – the geoglyphs of the 66th Bn and 13th OMR, shown here, being lost. Credit: Veterans Affairs Canada, 2017. 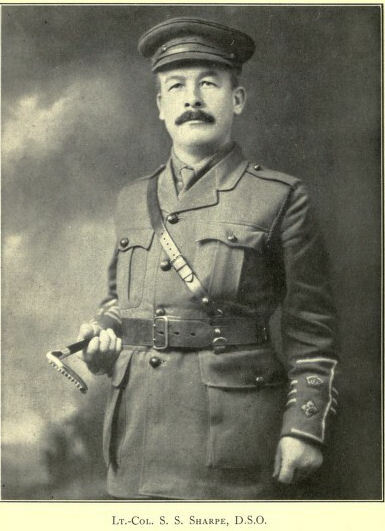 A Member of Parliament since 1908, Lieutenant-Colonel Samuel Sharpe used his influence in the House of Commons to raise the 116th Battalion (Ontario County) for the Canadian Expeditionary Force in 1915. A volunteer himself, Sharpe travelled from town to town in his constituency, (now Durham Region), recruiting the men who knew. The 116th would remain together as a unit throughout the war, fighting well at Vimy Ridge, Passchendaele and Avion. Sharpe himself would earn the Distinguished Service Order, while also being re-elected to the House of Commons whilst overseas, the only MP to ever achieve this. But the death and destruction of the war, which took its toll on the men he had personally recruited, weighed on Sharpe. In 1918, Sharpe was hospitalized and eventually returned to Canada, where he continued to received treatment for nervous shock at the Royal Victoria Hospital in Montreal. Unable to bear the thought of facing the families of those whom he had recruited and subsequently seen slain, Sharpe leapt from his hospital window on May 25th. At the time, Samuel Sharpe’s death was hushed and largely forgotten by those in Ottawa. However, with the recent awareness and realization of mental health issues such as Post-Traumatic Stress Disorder, Sharpe’s story has now come full circle. Championed by MP Erin O’Toole, Sharpe’s modern-day successor to his Durham Region seat in the House of Commons, Ottawa has no longer forgotten Sharpe’s life and sacrifice. A bronze bust of Sharpe was created in 2016, and is to be placed in the centre block of Parliament Hill, bringing recognition to his sacrifice as an MP who died due to war injuries. A newspaper clipping honouring Sharpe’s contribution and sacrifice. Credit: The Globe, Toronto, Monday, 27 May 1918. For further reading, follow this link: http://www.durhamregion.com/news-story/6382803-uxbridge-public-library-unveiling-a-sculpture-of-first-world-war-veteran-lt-col-sam-sharpe/ .